Reaching the Isles of Scilly is easy with connections from the mainland by ferry or plane. There are also inclusive train tickets available that include return train travel to Penzance from various stations, transfer to the airport and the flight or ferry. For details of all these options see below. Please note that helicopter services to the islands have now ceased. The Scillonian III ferry runs 6 days a week (Monday - Saturday) from late March through to the end of October. It normally makes one crossing per day from Penzance Quay to St Mary's Quay departing from Penzance at 9:15am and returning from St Mary's at 4:30pm. The crossing takes around 2 hours 45 minutes although crossing times do vary due to the tidal conditions. Some sailing times vary due to the tidal conditions and there are a few days a year when two crossings are made in a day. 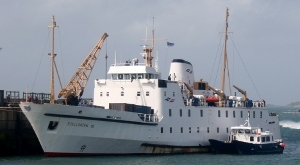 For details consult the timetable : Scillonian III Timetable. The normal ferry fare for 2011 is £42.50 each way per person. Note that this is a foot passenger only service - there is no car ferry to the islands. For further details please visit the Isles of Scilly Travel website. Long term parking is available at Penzance Quay. For details of car parking at Penzance Quay follow the links below. 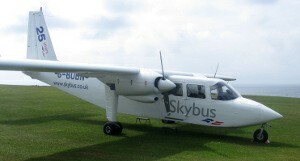 Skybus operate flights 6 days per week from Lands End, and Newquay with flights also operating from Exeter in the summer. Flights operate up to 22 times per day in the peak summer season from Lands End. Parking is available at Lands End Airport and there is a bus service available from Penzance which can be booked with your flight. Flights operate up to 5 times a day from Newquay although be aware that if flying from here you also have to pay and airport development fee to the airport. There is a bus service from Newquay to the airport. From Exeter there are also up to 5 flights a day and the airport is easily reached by bus from Exeter city centre and Exeter St Davids railway station. Great Western Railway operate an inclusive travel package for travel by ferry or plane. The ticket includes return rail travel from selected stations on their network, return transport to the island (by ferry or plane) and a free transfer to or from the airport or heliport if you choose to travel by air. Bookings for this service are only availably by telephone on 08457 000 125.